This work is devoted to analyzing three major frames of justice--group justice, individual desert, and life affirmation--and their implications for social policy as well as their reflections in contemporary social policies. Pelton finds that all three frames of justice are reflected in the Bible and, later, the Koran. He contends that there is no evidence in the Bible of a genesis or development from one frame of justice to another. Rather, a sense of justice has existed in the human mind from time immemorial, with the three frames coexisting and manifesting themselves in both inter- and intra-group relations. The prominence of one frame over another at any particular point in history or in a particular geographical location is influenced by a variety of factors, though it is ultimately open to human choice. Pelton compares and contrasts the philosophies of nonviolence and liberalism in regard to the frames, and explores the relationships between principle, sentiment, reason, justice, and policy. He discusses social science's problematic relationship to justice in policymaking--for instance, how scholars have focused more on the effectiveness of policies, largely in terms of statistical outcomes reflecting aggregate data analyses, than on their justice. He goes on to explore in depth how frames of justice give direction to social policies, including those of genocide. 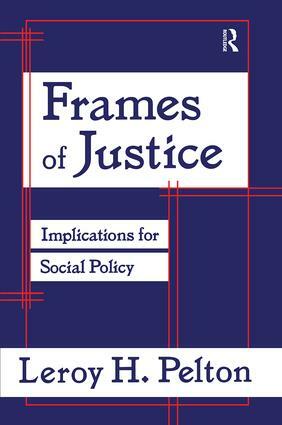 Frames of Justice is an outstanding work that analyzes the question of justice and social policy, while simultaneously exploring the notion of desert in religion, philosophy, and legislation--especially within the context of the moral question of the relationship between means and ends--and contrasting it with the principle of life affirmation.